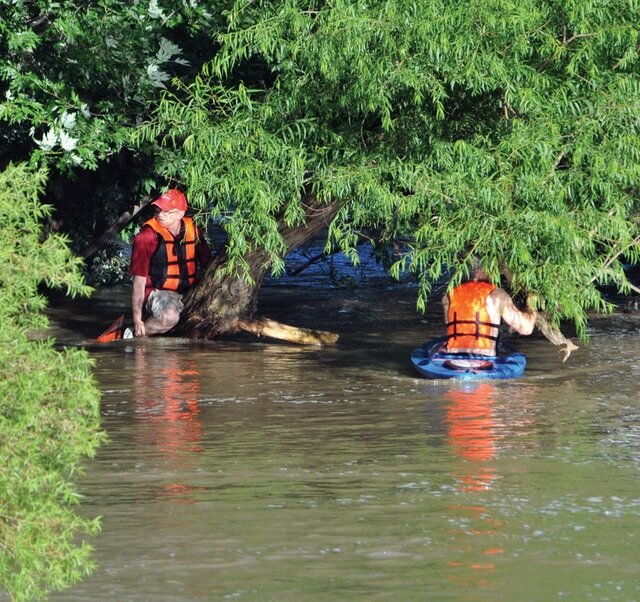 PIQUA — Two men are safe following several tense hours along the Great Miami River on Tuesday. Miami County 911 received a call around 6:10 p.m. that two men were stranded in river, between the Robert Shook Bike Path Bridge and I-75. One was reported to be in a kayak while the other was clinging to a tree. Both wore life vests. The man in the kayak was finally able to paddle upstream around 8:30 p.m. and make his way to shore, where firefighters were able to reach him. As water levels continued to rise, rescuers put boats in the water and managed to reach the second victim and transport him safely to shore by 9:15 p.m.
Crews from Piqua, Troy, Covington and Bradford responded with boat and water rescue experts. Recent rainfall, estimated to be between two and four inches in the last 24 hours alone, made the river waters high and fast as rescuers formulated a plan to rescue the men while minimizing danger to themselves. Miami County Hazmat was called out to provide lighting as darkness began to hamper rescue efforts. The Miami County Sheriff’s Department will be investigating the incident.